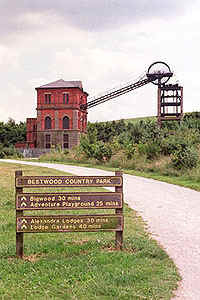 The Winding Engine House is the last remaining part of Bestwood Colliery - one of the busiest coal mines in Nottinghamshire. The winding engine lowered colliers into the mine shaft, and winched mined coal up to the surface. The tall brick building houses a huge winding engine. Originally it was powered by steam, but today's visitors see the massive engine moved by an electrical motor. The engine dates back to 1876, the heyday of Victorian industrial engineering. The site was allowed to fall into disrepair over the years following the pit closure but a team of dedicated volunteers undertook the massive restoration project. Read more about them here. Photos of the restoration project in progress are displayed in the Dynamo House. _Tours are available free, and led by members of the Winding Engine House Volunteer Group - a local community group dedicated to the preservation of this wonderful piece of industrial heritage. The Winding Engine House volunteers aren't around every day, so please check before setting out that a tour is possible. The Winding Engine is usually open for tours between 10am and 12noon on Saturday mornings from Easter to the end of October, but special tours for groups can be arranged outside of those hours. (Daily, 10.30am to 4.30pm) for more information. On your tour around the building you will use the newly installed lift to move up the various different levels of the building to the top where you can experience the sheer size and power of the winding engine. On the way back down via the steps you will hear the story of the mine during its years of operation until its closure in 1967. A virtual tour of the site is available on the NCC web site along with details of self guided tours. You can dial 0115 822 0268 to listen to a mobile phone tour which guides you as you walk around the site.